Semiconductor processes often quote figure of merit, Ft and Fmax. What are they? We believe that Fmax is a better measure of a transistor's capability compared to FT, does anyone want to weigh in on this? 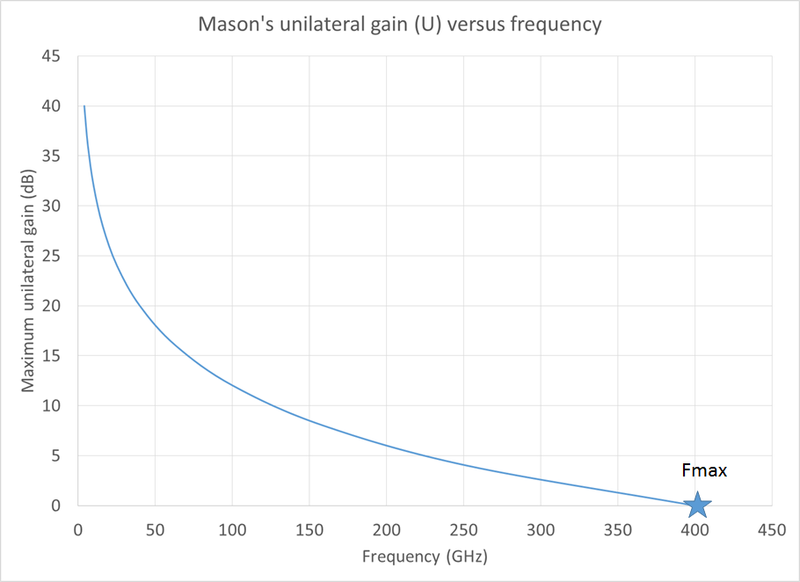 Fmax is the frequency where unilateral gain (U) becomes unity, or zero dB. "U" was developed by Samuel Jefferson Mason, (and also known as Mason's Invariant", the concept was published when transistors were having their third birthday party (reference at end of page). It is still one of the most important figures of merit for a transistor, especially at microwave frequencies. Now let's look at U on a log-freq scale. U is a straight line, with slope -20dB/decade, except down at low frequencies (maybe below 5 GHz), the slope will flatten out and intersect 1 GHz below 45 dB. We did not try to fake those data here, it was a lot easier to just show the range where -20 dB/decade applies. Note that 20 dB/decade is the same as -6.02 dB/octave. 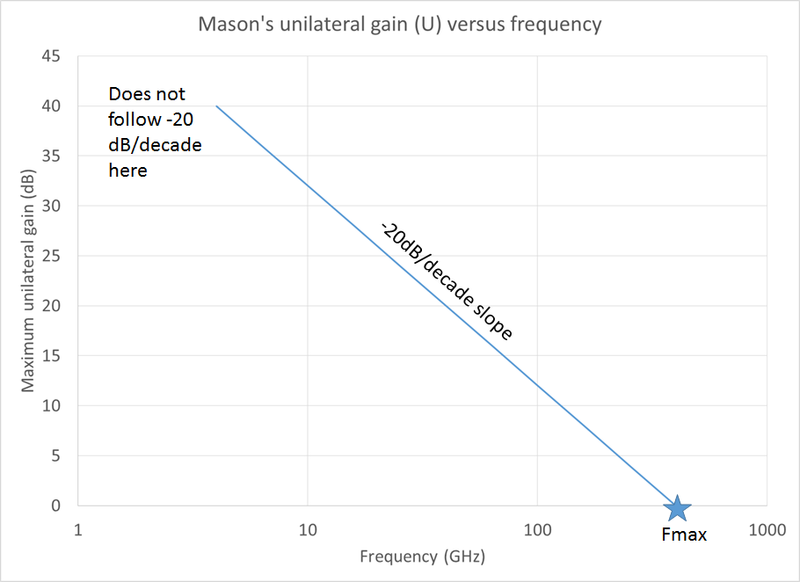 If you were applying a transistor with Fmax of 400 GHz at 94 GHz, U is 12.6 dB at that frequency. You can expect to achieve maybe 10 dB in a narrow-band one-stage design with such a device, matched for small signal gain at 96 GHz, allowing 2 dB or so for input and output matching network losses. We'll add to this later. FT is the "transition frequency" where current gain goes to unity (zero dB). S. Mason, "Power Gain in Feedback Amplifiers",Transactions of the IRE Professional Group on Circuit Theory , Volume CT-1, Issue 2, June 1954, pp. 20-25.